It’s been some two weeks since the 2018 midterm elections, and the cacophony of voices both lauding our nation’s progress and expressing disappointment in our lack thereof is still at fever pitch. Women won a record-breaking number of seats in Congress, the headlines blare, but at the same time, white women are getting blamed for what many liberals consider embarrassing losses: Beto O’Rourke in Texas, Andrew Gillum in Florida, and Stacey Abrams in Georgia. 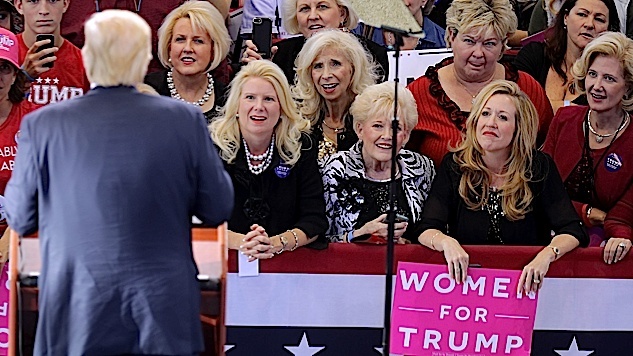 The focus on white women as a general demographic has led to think pieces bemoaning their collective acceptance of the patriarchy, of racism, and of white supremacy, as well as pieces employing the “#NotAllWhiteWomen” rhetoric, shaming critics who are lumping all white women together based on the color of their skin rather than the credence of their individual thought. (Imagine that.) In other words, the resulting analysis is as split ideologically as the very demographic it is attempting to study. So rather than calling for white women to do “the hard work” of changing their ways of thinking and therefore, voting, perhaps what is more helpful here is attempting to understand their wide gamut of priorities first. In order to understand why, say, that darn 53% bloc of white women voted for Trump back in 2016, or why white women voted for male candidates who support policies that harm all women this election—to cite just a few races, white women broke 76% for Brian Kemp, 59% for Ted Cruz, and 51% for Ron DeSantis—it is necessary to first dive into the historical context of white women and power. Specifically, why so many white women are so afraid of losing their power, and what they’re really voting for when they vote out of that fear. Historically, white women have been the less visible advocates for white supremacy, though they have been no less vocal. Elizabeth Gillespie McRae, historian and author of Mothers of Massive Resistance: White Women and the Politics of White Supremacy, notes that white women have played a huge part in upholding racial segregation throughout history, like when they rallied against school integration after Brown v. Board of Education, or when white women’s organizations helped fund the construction of Confederate monuments in the South. In this sense, then, white women have historically always sided decisively with their whiteness, often using the shield of “family values” to justify their actions and words. As the primary caretaker at home back in the ‘50s, for instance, white women prioritized family above all else—though their desire for “better schools for their children” didn’t necessarily translate into wanting better schools for everybody’s children, according to McRae. So the roots of white supremacy clearly run deep, even if it is disguised and explained away in different terms. And make no mistake: though images of the KKK and Neo-Nazis like Richard Spencer may come to mind when the term “white supremacy” is used, white supremacy is about normalizing racism first and foremost, and so when white women help to maintain the status quo in a society that is dripping in white supremacy, they, too, have power. Furthermore, because white women have historically foregrounded the home as the center of modern living, their priorities have largely revolved around keeping the family unit intact, safe, and free from outside influence. Put another way, their concerns (and again, this is in reference to “those white women,” not all) can largely be summed up as being about national security, the economy, and upholding the standards of their religious institutions, which often means voting pro-life, anti-LGBTQ, pro-guns, and anti-immigrant. Though white women as a whole are far from homogenous, it is not surprising that the things they care about do tend to stem from those same roots of white supremacy, even though it is rarely, if ever, thought of in that way. And as a result, white women are often willing to throw those whom they have “othered”—even other white women who have different priorities—under the bus for the sake of protecting their brood. It would be wrong to think that white women don’t care about others; they do. The problem, though, is that voting in support of building walls, discriminating against Muslims, and candidates accused of sexual assault means they care more about themselves than they do others, or don’t want to acknowledge that their decisions will harm others who are unable to stand up for themselves for lack of resources, voice, or both. The truth of the matter is that the most dire instances of bad policy will never actually hurt white women the way it will hurt others; it will almost always impact women of color, members of the LGBTQ community, and others who are disenfranchised in ways that can’t be assuaged by whiteness. So if the home is central to most white women’s concerns, then anything that stands to threaten it (foreign terrorists, outsourced jobs, feminists) automatically becomes the enemy, and issues that are notoriously “women’s issues,” like pay equity, maternity leave, and right to an abortion, become a secondary issue—at best. In this sense, while it may be true that some white women lean heavily on the opinions of their fathers, husbands, sons, and pastors, for the most part, those who choose to vote along party lines have thought through what it is they’re voting for, and have shown what it is they prioritize: their families. Tradition. America’s return to the supposedly great nation it once was. In their eyes, they are far from “voting against their own interests.” They are voting for them. What white women fear is that, however irrational, if they vote against tradition and against what they see as “family values,” then what power they currently hold will be lost. In the same way that many white men seem to see power as a zero-sum game, so white women want to cling to the agency and selfhood they feel they have fought so hard to achieve. You can see it in the reactions white women have toward negative tweets and stories about white women; there is a pushback, a pride in saying that they voted of their own volition, and with their own logic, and not just because they happen to belong to a certain gendered demographic. But fear is just the flip side of conviction. How these white women voted in the 2016 election and more recently, in the midterm elections, reveals what they fear most—a loss of power and a loss of voice—ironically, the very situation that their own votes are putting others in. The problem with their conviction then, is that white women are continuing to center their priorities and their fear of loss ahead of others’ lives, and in that situation, it’s hard to argue that anyone really wins in the end.